I am buying seed and some tools to do the Indoor Plants Project. You will feel amazing when the the seed is coming out of the soil.But after, I am in trouble, they fall down. What is going on, it is sad to meet this. Here are picture of my indoor Growing. As I want to try once again, so now I search Google to learn how others do their project. It is great adventure! As you know, it is so complicated. And I believe the quote from Sun Tzu. Indoor Plants have lots challenge. Choosing Grow Light is wicked thing, it is hard, complex! You MUST Know your plant, know the nutrients needed, and know the light required. That you will be a winner. Plants love eating sunlight, converting the solar energy to chemical throught the process of photosynthesis. And plants, just like us, are what they eat. The spectrum type, length, and intensity all play key roles in vegetative cultivation and overall plant health. It is not the character of Lighting Products itself. It is for its customer Greens!!! Actually, on the subject of Light cycles. Cannabis is a light demanding plant. Professional growers keep the light on their plants using the 24/0 photoperiod for this reason. Plants that grow under 24/0 flourish and do not need a quantity of darkness in order to rest and perform photosynthesis properly. Plants that are grown in optimal conditions under 24/0 light regime grow vigorusly and the benefits of a 24/0 photoperiod can be seen actively in the results. More nodes are formed, more branches are created, leaf numbers increase, the plant is growing at its finest. Some growers opt to use 18/6 as their photoperiod. This is 18 hours of light, six hours of darkness light regime. Under these conditions the plant will grow quite naturally but not as vigorously as the 24/0 photoperiod. The 18/6 photoperiod expels 3/4 the amount of light that a 24/0 photoperiod does. Although this does not mean that a plant produces 1/4 less leaves,branches and nodes under the 18/6 photoperiod, it certainly does show the correlation between light and cannabis growth. As we have said already, cannabis is a light demanding plant. There are no problems associated with 24/0 and although some have attributed cannabis sexual dysfunction (the hermaphrodite conditon) to 18/6 photoperiod these problems are actually the result of heat stress. A 24/0 photoperiod requires that your grow room temperature be kept well monitored. The 18/6 option is cheaper to run. You use a quarter less electricity and this will have an impact on your electricity bill. Also the 18/6 photoperiod will generally extend the bulb’s lifespan. During the 6 hours of darkness the grow room is allowed to cool down for this period but a well maintained good grow room setup should not require a cooling down period. “low heat production” is actually a misnomer here. The common-type T12 and T8 florescent tubes actually have high heat production compared to HID lighting of an identical wattage. However that heat production is over a very large area (big long tube) and thus the surface temperature of such tubes is low. However they are actually producing more wasted heat energy per watt of light than other grow lamps. This is less true with super-modern T5 tubes with digital ballasts. These lamps are less common though and a lot more expensive. Intensity is also a problem with florescent tubes. Once plants get big enough the tubes can’t penetrate to the lower foliage like a HID can. Large screw-in Compact Florescent bulbs actually have better intensity characteristics. Limited spectrum output is also not strictly true for floros. Many manufacturers employ a phosphor coating in their floro tubes which burns a nice red color. 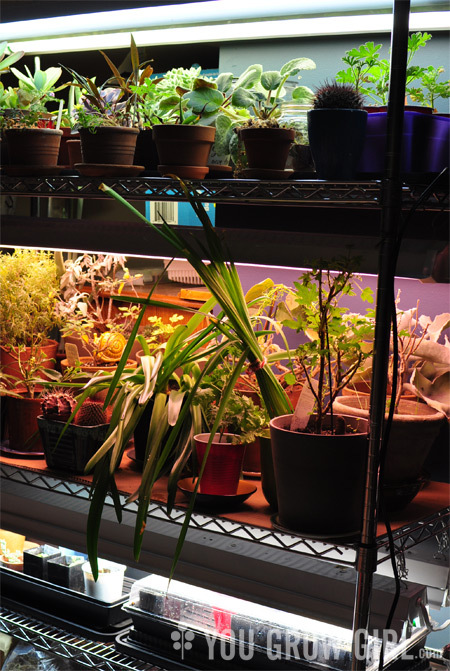 Phosphor-coated T5HO lamps, for instance, would be quite suitable for flowering smaller plants in compact gardens. Pricey though. Thousands? As in more than a grand? Man you crazy. A good 1000 watt MH lamp with a proper digital ballast, nice reflector and horticulture-grade bulb should be no more than $500. I could see paying up to $700 if the lamp had bells and whistles such as MH/HPS cross-compatibility, digital dimming or other fancy bits. Same goes for HPS lamps. The color spectrum limitations of HPS lamps are quickly disappearing. Many horticulture-grade HPS bulbs produce plenty of blue light along with the red, making them burn a bright white color. Ceramic Metal Halide bulbs have similar bright white full-spectrum output; with less red for heavy flowering but more blue for vegging, and contrary to their name, they actually tend to run with HPS ballasts. LEDs are new on the scene but could well be the future of indoor grow operations. They work like any other LED light, a bunch of low-wattage LEDs are arrayed on a circuit board and produce light. LEDs are, unlike other High Intensity Discharge (HID) rigs, exceedingly energy efficient. This is because they’re capable of producing the exact wavelength of light desired and no other. This means that an LED light programmed to shine at 5700K will shine at that an no other. Some LED rigs are also able to produce light at two distinct spectrum point simultaneously without any bleeding into other inefficient wavelengths and minimal heat production. LED tech is still in it’s infancy when it comes to lamps suitable for growing productive plants. Many manufacturers claim to make LED panels with the same growing power as a 400 watt HPS lamp or whatever. These manufacturers are lying. They may get the same lumen output, but they have nothing like the intensity of HID technology. Lamp intensity is the main sticking point for growing with LEDs. The little things just can’t muster up enough penetrating power to grow large plants with big fat flowers. As of now there is a minor exception to this rule and that is one watt LEDs. Most LED units on the market operate at a fraction of a watt per diode. However there are a few high-performance units available that push up to 1 watt per diode and even more. These units, when used in an array, can produce decent intensity for plant growth. Sadly most of such units are white in color and actually unsuitable for use on plants. Much better for big flash-lights. Red and blue spectrum one watt LEDs are available though. This technology is efficient, effective and just wicked cool, but from what I’ve heard there are problems. Such powerful LEDs generate a lot of heat relative to their size causing hot-spots on the backs of the units. They aren’t emitting a lot of BTUs given their light output, but because they are so small they can hit high temperatures. This problem is seriously exacerbated when you cluster the LED’s densely enough to make an effective grow lamp. Real-world users of such grow-lamps almost universally resort to water-cooling systems of some kind. This of course adds to the already considerable cost/complexity burden of running LEDs and that really narrows down the desirability of such solutions. This is why you only hear a lot of love for LEDs from growers who operate indoor grows 100% off-the-grid. Do plants use all light spectrums produced by the sun? Most indoor growers seem to believe that the best indoor grow lights would have the same light spectrum as the sun – a relatively full spectrum over the visible light frequencies. After all, plants evolved over millions of years to best convert light energy into carbohydrates and sugars. The most readily available light from the sun is in the middle spectrums which we see as green, yellow and orange. These are the primary frequencies that human eyes use. However, studies show that these are the least used light frequencies in plants. Most of the photosynthetic activity is in the blue and red frequencies. The main reason for this counter-intuitive use of light by plants seems to be related to early forms of bacteria and the evolution of photosynthesis. Photosynthesis first evolved in bacteria over millions of years in the primordial sea. This evolved in bacteria long before the appearance of more complex leafy plants. These early photosynthetic bacteria extensively used the yellow, green and orange middle spectrums for photosynthesis which tended to filter out these light spectrums for plants evolving at lower levels in the ocean. As more complex plants evolved at lower levels they we left with only the non-filtered spectrums not used by bacteria – mostly in the red and green frequencies. The yellow, green and orange light is mostly reflected off the surface of the leaves and this is why photosynthesizing plants are green. Do different light spectrums do different work in plants? Not only do plants focus on specific light spectrums for photosynthesis but different light spectrums are used for different types of growth in plants. There are millions of photosynthetic receptors in a leaf of a green plant. Each receptor includes specialized pigments that absorb specific frequencies during photosynthesis. By measuring the amount of oxygen produced under various light spectrums we can measure the amount of photosynthetic activity under each light spectrum. This has produced a very detailed map of which light spectrum is related to which type of plant growth. This range of spectrum enables cryptochromes and phototropins to mediate plant responses such as phototropic curvature, inhibition of elongation growth, chloroplast movement, stomatal opening and seedling growth regulation. It affects chlorophyll formation, photosynthesis processes, and through the cryptochrome and phytochrome system, raises the photomorphogenetic response. In more practical terms, these wavelengths encourage vegetative growth and are essential in lighting for seedlings and young plants during the vegetative stage of their growth cycle, especially when “stretching” must be reduced or eliminated. It also stimulates the production of secondary pigments which can enhance colors and is known to also stimulate Terpene (i.e. fragrance) production. Most green light is reflected off the plant and plays a much smaller role in plant growth. However, there are some important aspects of light in this range so a certain amount of light in this spectrum range is beneficial. Green light is sometimes used as a tool for eliciting specific plant responses such as stomatal control, phototropism, photomorphogenic growth and environmental signaling. When combined with blue, red and far-red wavelengths, green light completes a comprehensive spectral treatment for understanding plant physiological activity. The function of green light is less well understood than the other spectrums, and there are only certain species of plants that require green light for normal growth. It’s effects appear to be very strain specific. The pigments that can absorb green are found deeper in the leaf structure so it is thought that because green light reflects off of the Chlorophyll in leaf surfaces and thus is reflected deeper into the shaded areas of the canopy than Red and Blue which are readily absorbed, that green may actually be mostly absorbed through the undersides of the leaves as it bounces around in the shaded depths of the canopy. Red light affects phytochrome reversibility and is the most important for flowering and fruiting regulation. These wavelengths encourage stem growth, flowering and fruit production, and chlorophyll production. The 660nm wavelength has a very strong photosynthetic action and also exhibits the highest action on red-absorbing phytochrome regulated germination, flowering and other processes. Most effective for light cycle extension or night interruption to induce flowering of long-day plants or to prevent flowering of short-day plants. Although the 730nm wavelength is outside the photosynthetically active range, it has the strongest action on the far-red absorbing form of phytochrome, converting it back to the red-absorbing form. It becomes necessary for plants requiring relatively low values of the phytochrome photoequilibrium to flower. Can be used at the end of each light cycle to promote flowering in short-day plants such as Cannabis. Also, a higher ratio of far-red to red than found in sunlight can trigger the shade stretch response- where a plant when sensing it is shaded based on an elevated ratio of far-red to red- will stretch to try to elevate its canopy above its competitors. This is why too much far-red is not advised if compact plants are desired, or in general. But small amounts or FR as provided by California LightWorks in our R/FR channel is very beneficial, and for this reason the ratio or R to FR is fixed on one channel in the 550 series. As we discussed earlier, plants require different light at different phases of their growth. Some manufacturers have built the capability to switch spectrums into their lights. Unfortunately, tests have shown that plants do not react well to an abrupt shift in spectrum and their growth can actually be hindered for a period of time while they adjust to the new spectrum. Lets go to review some products in the market!! Here is the google trend of the grow light!! How About DIY LED Grow Light?!! At first, It is so simple to make a LED grow light! They are just power supply + LED Source. That’s easy as ABC! Soon, I feel sad of myself, there is lots of drivers, LEDs in the market! Which is the better? No one tell me? How is the life? How is the quality? And i find some useful picture below. It is Power Supply System + Mechanical System + Light System+ Thermal System. It is more complex thing if you go deep. It is tough thing, if you are serious doing something. A good products must pass the Rosh, Reach, Recycle, Safety, EMC, Performance and Photometry. Hope thing is going clear now. So back to our business! I should choose the best thing for my greens. Simplify, I choose the MEAN WELL Driver, CREE LED Source. Here is the project around the world.